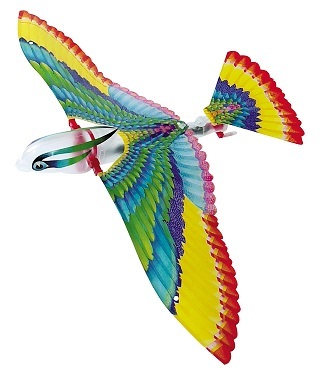 Tim bird is a mechanical bird made of plastic that flies by flapping its wings, the same way a real bird does. It is designed with shapes and features similar to that of a real bird, which makes sense since we know that real birds are well suited to flying. Their body shape and size are geared towards being able to fly through the air. The bird is wound up by twisting a rubber band and then releasing that energy to make the bird's wings flap. When the rubber band runs out of energy the wings stop flapping and the bird glides back down to earth. If you look at the bird you will see that it weighs very little and has a streamlined shape which helps make the flying easier. The bird is also made out of a strong and light plastic. Another interesting feature of the bird is how the twisted rubber band transfers its energy into the flapping wing motion. Have a look at the mechanism used to do this. Another flying toy which uses a twisted rubber band as an energy source is a rubber band airplane. I had a lot of fun with these as a kid. The rubber band would directly turn a propeller which would make the plane fly. The Tim bird uses a more complicated mechanism to convert the twisting motion of the rubber band into the flapping motion of the wings. I don't know about you, but I think the Tim bird is even more fun to play with!